With the blink of an eye,November is here.Wasn't it only a few days ago we did the October Punch and more important,wasn't it only a few weeks ago I celebrated my birthday? ?Gosh,time really flies. So here we are back with another punch,this time a Mousse/Souffle.I was intrigued when the recipes were posted,this time,we had not one but three recipes to choose from.November Punch is hosted by Ria of Ria's Collection who chose Tomato Souffle,Chocolate Mousse and Triple Chocolate Mousse for our Mousse challenge this month.We were given an option of choosing any one of the lot. I am not a Mousse fan,not because of the raw eggs syndrome-that too,yes but I somehow never fancied eating through something which was so creamy that it would choke me.But a challenge is to be done and no prizes for guessing,I chose the easiest of the lot-Instant Triple Chocolate Mousse recipe by Nigella Lawson.Though I never,never fiddle with the recipes,I did a total leap from my usual self this time and happy to say--it worked out! !I did not measure the ingredients,not a good thing,I know but the Mousse was yummilicious and totally won our hearts.We are instant converts,only this one though! My co-sis tried the same recipe without adding butter and she got a very delicious mousse too.That explains,this recipe is quite forgiving,whichever way you try you would end up with a delicious bowl of Mousse which you wouldn't want to share with anyone!! Put the saucepan on the stove, over heat, though keep it fairly gentle, to melt, stirring every now and again. Remove from the heat. Meanwhile whip the cream with the vanilla until thick and then fold into the cooling chocolate mixture until you have a smooth, cohesive mixture. Pour or scrape into 4 or 6 glasses or small dishes and chill until you want to eat. We couldn't wait till it set completely and dived in..delicious nevertheless!! Instant Triple Chocolate Mousse makes it way to Madhuri of Cook-Curry-Nook's Chocolate Fest,have you sent in your entries yet? ?Check out her blog for a cool giveaway to celebrate her blog's first anniversary!! 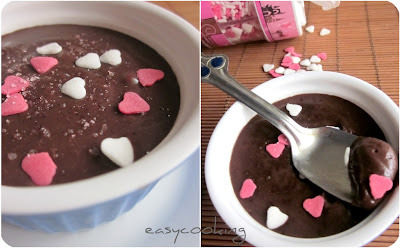 This choco mousse looks simply irresistible for a chocoholic like me...Yumm!!!! Wow that looks sooooooo perfect and so tempting. divya why do you post these yummilicious recipes ???? Woww.. Looks so perfect and delicious... Mouth watering clicks dear !! Erm hi. When you say cream, it is okay for me to use any kinds of creams? O.o? if it's not, then what specific cream should I use?